A delicious addition to a holiday dinner or an appetizer spread for a party! Wash, pat dry, and tenderize pork loin using a Jaccard Meat Tenderizer. Season with fajita seasoning and place in crock pot that has been sprayed with Pam Cooking Spray. Lay strips of the bacon across top of the pork loin, add Rudy's Red Wine, and then cover the pork with Rudy's Cranberry Sauce. Cook on high for 2 to 2-1/2 hours, and then continue cooking on medium until done. 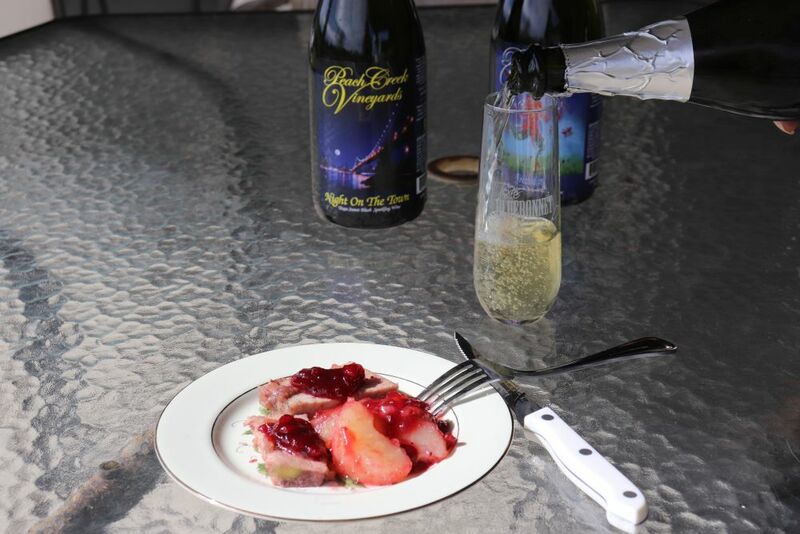 Serve with Apple Cranberry Crisp, and enjoy with Peach Creek Frivolity Sparkling and Orale' Wines. Stir together sugar and wine in a heavy 3 qt. saucepan over low heat until blended. Add cranberries & cornstarch, bring to a boil, and cook over medium-high heat, stirring often, until cranberry skins begin to split (around 10 minutes or so). Remove from heat and mash with a potato masher for whole berry sauce. Or if you prefer a more pureed type sauce, let mixture cool for 15 minutes. Then pulse mixture in a food processor three or four times, or until the cranberries are pureed to desired consistency. Next, stir in orange juice and orange zest (or Grand Marnier if you prefer). Chill slightly before spooning on pork loin so that it will not all run off. You will have more cranberry sauce than you need for the pork loin so the remaining sauce can be chilled and then later served over Blue Bell Homemade Vanilla Ice Cream for dessert! This cranberry sauce recipe was adapted from a recipe submitted by Leslie Sutherland, Fort Worth, Texas, to Southern Living, November 2008. Heat oven to 375. For topping, combine oatmeal, 1/3 cup brown sugar, flour, 1 tsp. cinnamon and nutmeg; mix well. Stir in melted butter ; mix until crumbly. Set aside. Then combine cranberry sauce, remaining 2/3 cup brown sugar & 1 tsp. cinnamon with the cornstarch in a large saucepan, mix well. Heat over med high heat, stirring occasionally, 2 mins or until sauce bubbles. Add apples, tossing to coat. Spread into 13x9 baking dish. Crumble topping over fruit. Bake 25 to 35 mins or until apples are tender. A wonderful accompaniment to pork; also delicious with ice cream. Recipe adapted from one my Mom used (origin unknown).